Indiana is in trouble. We are declining educationally, economically, socially and environmentally. Even our physical bodies are in poor shape. Our state is like a third world culture within a broader society experiencing a Dark Age. 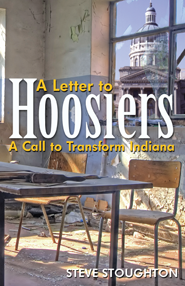 We need a period of enlightenment – a time where a cadre of transformative leaders will come forward to commit their lives to renew Indiana. This is the only way long lasting change will take place. “Never doubt that a small group of thoughtful, committed citizens can change the world. Indeed, it is the only thing that ever has.” (Margaret Mead, noted anthropologist). Are YOU one of the future leaders? The intent of this book is to inspire women and men who have vision, creativity, courage and commitment with a servant’s heart to step out and begin working together to make their world a better place for everyone.